This 16 pin DIP test clip is generic for all purpose. 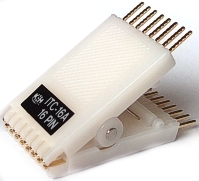 It can be used as in circuit programming, data log, IC pin signal mornitoring, probe for logic analizer. It have gold plated contact for better contacting.